The ever-swelling world of multi-cuisine restaurants in Delhi has a new entrant: The Immigrant Cafe. The casual, two-storeyed eatery stands where once La Bodega did in Khan Market. It is not as much a reincarnation of the Mexican joint — that opened well but time and a dwindling patronage dampened its ardour — as it is a makeover. 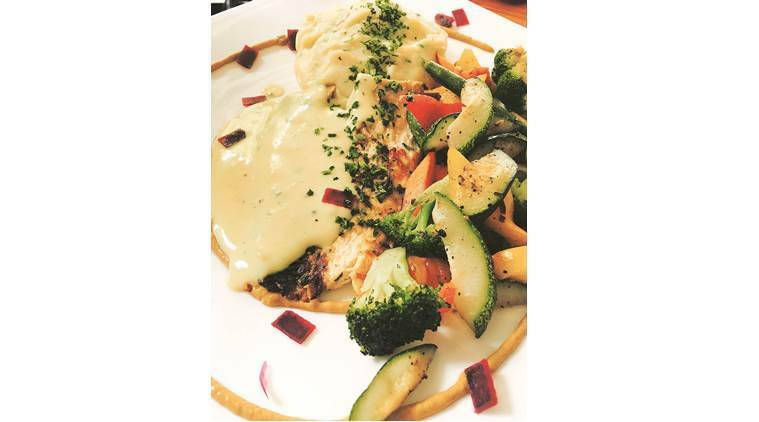 So, those who have walked through the sunlight-washed, roomy La Bodega, will not be surprised with anything new except the menu, which offers North Indian, Italian, Continental, European, finger food and Chinese cuisines. Now, it would be easy to dismiss The Immigrant Cafe as a place that tries to do too much and ends up with little impact but it does leave an impression with what it intends to do. Particularly when it holds out modern interpretations of classic Indian dishes — and those are the ones that seem to most conspicuously display the chef’s vision. Among the salads, tostadas, quesadillas and dim sums are appetisers like Yogurt Formage (Dahi Ke Kebab), Butter Chicken Samosa, Shami Scotch Eggs and Mushroom Galouti. The Crab Puchka at our table had crab sticks stuffed in gol gappa shells topped with a lemon and coriander foam. It’s a beauty that lures but fails to strike the taste buds. If the saying, “appearances can be deceptive” was a dish, this would be it. The foam is too little, too weak to stand up to the crisp wheat cup and the imitation meat. Similarly, the Pindi Donut, a nifty concept, is distressingly delusional about itself. As if the incongruence between the chhole and the donut was not enough, the chef sends across a pile of rapidly melting carrot foam along with it. What is one to do? The Grilled Sole, from the mains section, comes doused in a lemon mustard sauce with a pile of grilled vegetables and a side of mashed potatoes. It doesn’t set the heart racing, though it is cooked to perfection and for a change, the flavours work. Tilting towards the restaurants safer offerings, we wager on the churros. And it pays off — dusted with cinnamon and sugar, they come with chocolate ganache and vanilla milk and it’s hard to stop at one. There is no dearth of know-how in The Immigrant Cafe’s kitchen. All the dishes are skillfully crafted and each component is well-delivered. They just fail to sing in chorus. And there is nothing that salvages a dish that does not set the taste buds ringing. Not even foam. Especially, not foam.